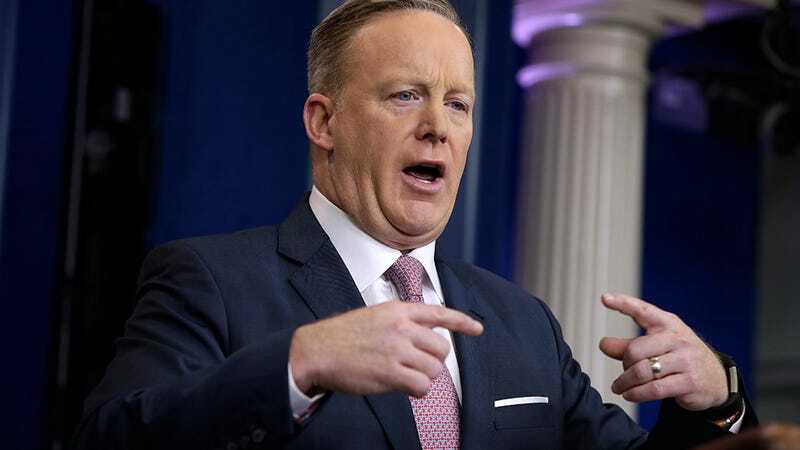 In a briefing this afternoon, Press Secretary and shambling ball of clay Sean Spicer claimed that none of the female White House staffers he’s “aware of” participated in today’s A Day Without A Woman strike. We hate to trust Sean’s powers of awareness on this one too, but it’s the best we’ve got for now. I think that we should on a daily basis not just one day a year but 365 days a year appreciate the contributions that women make in all of those categories so it’s not, it shouldn’t be a daily thing and it’s, hopefully we can help fix that all bit more. He starts off strong, but written down it’s clear Spicer has vomited up a run-on sentence with no clear meaning. Trump himself sent a pair of tweets this afternoon in which claimed he “honored” and felt a “tremendous respect” towards women, a group of people he has repeatedly and unapologetically undermined through his words and proposed policies. In stark contrast to the White House’s apparent non-participation by female staffers—which was limited to a single, neutral tweet from Small Business Administration head and WWE co-founder Linda McMahon—at least ten congresswomen staged a walkout in solidarity with the strike this afternoon. If any women working in the White House wanted to walk out today and pressured, threatened, or otherwise told not to, you know where to reach us.